“Karremelkstampers” is not only a fun word to say, but it represents the wonderful cross-cultural exchange that makes the Twelve Days of Christmas such a meaningful event. It’s a traditional dish from the Flemish region of Belgium, where chef Kobe Desramaults was raised and is now chef and owner of the Michelin-starred restaurant In de Wulf. I had his version of “karremelkstampers” there earlier this year, when I spent a night at his family’s quaint farmhouse in the hilly Belgian countryside near the French border. “Karremelkstampers” translates into English as “buttermilk smash.” It’s kind of like mashed potatoes, made with buttermilk. At In de Wulf, Desramaults bakes whole, waxy potatoes in dough, and presents them at the table, still steaming in the crust, with a frothy, buttermilk dip that is also served warm. 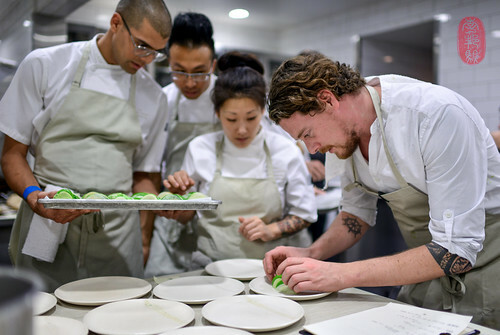 On the third night of this year’s Twelve Days of Christmas dinner series, Desramaults shared this cultural curio from his corner of the world with the guests at the Restaurant at Meadowood. Cracking open rounds of ashen bread at the table, the potatoes, which had been baked individually, were presented, piping hot, beside bowls of that warm, cheesy fondue that I remembered so fondly from In de Wulf. That was true of his dishes at this year’s Twelve Days of Christmas. Among them were slices of cured mackerel that were lightly torched on the skin side, and served with a paper-thin slices of kohlrabi and apples. There were also fat oysters, nestled on a bed of melted celeriac, and glazed, simply, with a sauce made of whey. 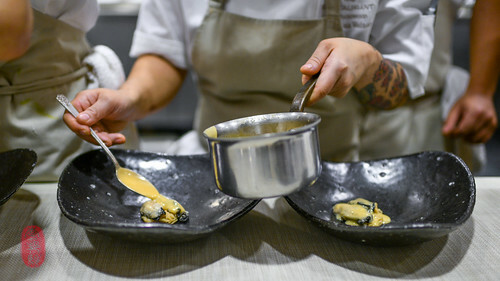 Together, it was a creamy, rich coupling that, like a lot of Desramault’s cooking, is laced with just a touch of acid to help cut through the saturated flavors. Organically raised lamb belly was rolled, like porchetta, sliced, and then grilled on the Josper to crisp-up the fatty, gelatinous rind. Desramaults served this with a little bit of lamb jus and wild mushrooms. Desramaults ended his run of dishes with a cloud of tangy yogurt stained with a spoonful of syrupy compote made from elderberries and huckleberries. All of this was topped with a gossamer-thin disc of sugar glass colored with beet juice, and an inky glaze of the berry juice. The beet disc was so thin that, at first glance, it appeared as if a glassy sheet of syrup was levitating above the yogurt below. It cracked effortlessly, almost under the weight of my stare, the shards almost dissolving before they even left the bowl. This was a spectacular dessert. 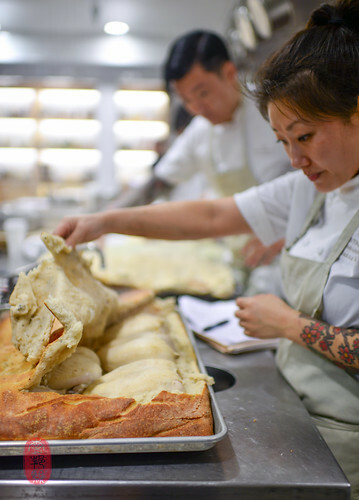 Kostow and his team have perfected the art of baking fowl in bread. At last year’s Twelve Days of Christmas, we saw a beautiful guinea hen nestled in a giant, sourdough boule, circled with a garland of herbs. 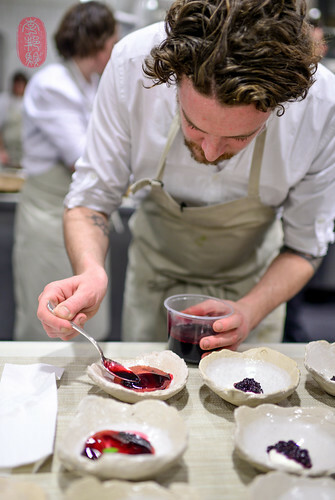 This year, to complement Desramaults’s bread-baked potatoes, the Restaurant at Meadowood presented juicy chickens, baked in sourdough and served with a side of the crust. Those golden shingles dripping with schmaltz, were amazing. Below, you’ll find the menu from the third night of the Twelve Days of Christmas with Kobe Desramaults of In de Wulf and thebiodynamic wines of Ted Lemon (who, with his sense of humor, arrived sporting a tie of lemons) of Littorai. 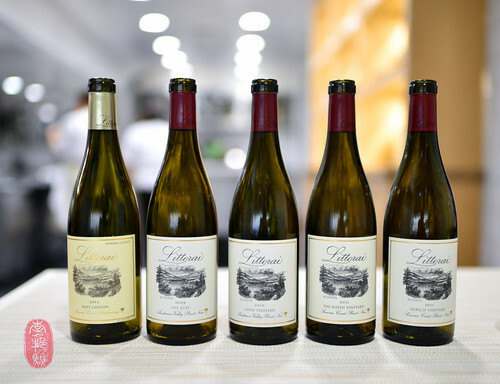 (I love Littorai’s pinot noir, but I especially loved the “Mays Canyon” chardonnay served at this dinner). Following the menu, you’ll find a slideshow of all of the photos that I took at this dinner. Kohlrabi, lovage, apples, with sorrel cream. ~ by ulterior epicure on December 11, 2014.